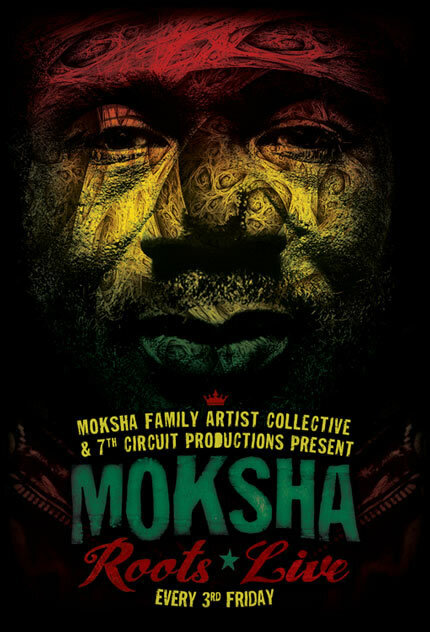 The third Friday of every month, 7th Circuit Productions and Moksha Family Arts Collective present Moksha Roots Live. The after party for The Rhythm Foundation’s ~ Big Nights in Little Haiti. In May we are celebrating Haitian cultural month. Every third Friday we will feature our gallery, live music, d.j.’s, performance, live painting, vendors. The Moksha Family Arts Collective is a non-profit organization, all funds go to supp…ort our local artists and community projects. Come out and enjoy this cultural evening of good vibes and amazing energy. The last two third Fridays were burnin! Kazakâ€™s unique fusion of â€œRasinâ€ (Haitian Roots music), jazz, political commentary and electric stage presence led it to be voted â€œBest Haitian Bandâ€ in the Miami New Times for three consecutive years. Sebon has been featured as a soloist with world-renowned musicians including Don Cherry, Nana Vasconselos, and the Urban Bush Women. In addition, he has performed with Teo Castllanosâ€™ D-Project in China, Ecuador, Peru and across the United States. The Moksha Family Roots Collective band is a constant rotation of Miamiâ€™s finest roots and world music musicians with international guests. This evening we are featuring Bagga Traxx with special guest Mecca a.k.a Grimo, plus more. DJ Moses opens the door to authentic high quality world music and invites you in to discover how glorious, diverse and deep music can be. The African continent, Jamaica, Haiti, Brazil, the U.S. and Latin America are all represented in his selections. DJ Moses is one of a kind in our community. Originally from New York City, DJ Moses has been living and working in Miami since 1995. Brandon Paul’s art is an eclectic mix of pop culture and surrealism, with heavy influence from street art, tattooing, skateboarding, and urban culture.His paintings resemble a mass of organic matter, that somehow engulfed a piece of graffiti, and a hip hop concert then toss in some pretty ladies, sea life, birds, and what your left with is a beautiful piece of controlled chaos wearing nikes . Actor, singer, dancer, choreographer, director, and circustician; Lucky Bruno, Tribe of the Red Moon, has been part of Moksha Family for the past 8 years performing eccentric, innovative, and other worldly performances. During his performances he aims to create a sense of global circus hysteria, with the extreme hope of touching and captivating his audiences with joy and inspiration. Environmental light wizard aka VJ CARE is a south Florida multi-media artist originally from Seattle, Wa. She has traveled the world spreading light through creativity for a wide range of artists & visionaries including, Terrence McKenna, Michael Franti, Sonic Youth, George Clinton & The P-Funk All Stars, Dale Chuhily & many others. Transforming the physical space to support the experience, her vision is to create multi-sensory experiences that connect, inspire & engage.